The turbulent sixties ended with a staff of unlikely-named deejays playing pop hits on WFEA. During the 1970s Granny Goose, Johnny Tripp, Jeff Truehart and R.W. Churchill were joined by the likes of Rick O'Shea (Bill Mundae), Tom Foolery (Beau Raines), Hap Hazard (Dominick Biello) and Penrod Rideout (Victor Pryles). By the fall of 1970, the Century jingles no longer had the punch WFEA wanted for its Hitpower format. A truly awful jingle package was recorded at Boston's Berkeley School of Music and edited by Granny Goose. 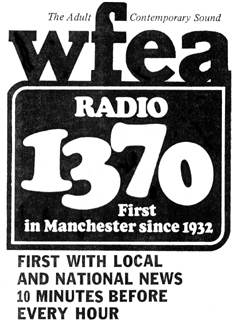 Through its first forty years, WFEA carried many high school sports, but never aired professional sports play-by-play until the 1971 baseball season when it out-bargained WGIR for rights to the Boston Red Sox for one season. Significant management changes occurred in the fourth quarter of 1971. Rudy Nelson resigned as vice president and general manager. After becoming a 30% stockholder in Century Broadcasting Group, Inc., H.D. "Bud" Neuwirth was elected to the company's board of directors on December 1, 1971. Upon election, Neuwirth acquired 85.5% of the stock held by several of the original minority investors and became WFEA's general manager. He had an extensive radio career and had worked for Metromedia in New York. Neuwirth began leaving his imprint on Manchester's oldest radio station. In 1972 he hired Warren Bailey from WORC in Worcester to be news and program director, and the parade of disc jockeys continued as the musical sound focused on harder rock and roll. In late December, 1973, Bud Neuwirth acquired 75% of Century's stock and held another 20% in trust for his wife and children. He became president of the company. Mitch Leigh and his partners had apparently found WFEA to be an impossible dream. Neuwirth sold WFEA in June of 1976 to Ocean Coast Properties Inc. of Portland, Maine. The principals in the $500,000 transaction were Phil Corper, Robert J. Gold (each of whom owned 20%), and three other stockholders. Gold served as WFEA's vice president and Stu Flanders was appointed general manager. One of his first acts was to expand WFEA's daily schedule to 24 hours a day. In 1978 Scott Norton replaced Stu Flanders as general manager of WFEA. He oversaw a transition to an on-air image revolving around 13 FEA Musicradio, with a mixture of 70% hits and 30% gold, targeting 18-49 year-olds. 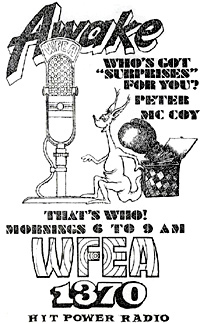 Donn Parker dropped a bombshell on the New Hampshire broadcasting community in April 1979 when he concluded a 17-year career at WKBR to become WFEA's sales manager.